The project is located at Bai Son commune, Do Luong District, Nghe An Province, S. R. Vietnam. 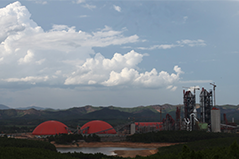 Sinoma (Suzhou) Construction Co., Ltd. as the General Contractor for the construction of Song Lam 2×6000t/d Clinker Production Lines gained trust and praise from the Owner, Song Lam Cement Joint Stock Company. Song Lam cement factory 2x6000TPD clinker line-B is successfully ignited on October 17, 2016.